On Tuesday, NASCAR Sprint Cup team owner Jack Roush was involved in a private jet crash as he was attending an air show in Oshkosh, Wisconsin. While Roush had always confirmed with suffering injuries, it was initially played down as non-serious. Over the next few days, the reports of several facial surgeries has understandably sparked widespread concerns in the NASCAR community for the multi-car team owner. Arriving at Pocono Raceway, the four-car Roush-Fenway operation joined the rest of the NASCAR Sprint Cup field for the Sunoco Red Cross 500 with their leader. Apart from Jack Roush's injuries, the team has been battling an on-track losing streak stemming back to the fall 2009 race at Talladega by than team driver Jamie McMurray (McMurray has since won twice in 2010 with new team Earnhardt/Ganassi Racing). In qualifying, Greg Biffle #16 Ford was the highest-placed Roush-Fenway Racing runner in 12th place on the starting grid. Outpaced by pole sitter Tony Stewart and Juan Pablo Montoya in Chevrolet's, the race showed no signs of altering the fortunes of the Roush-Fenway Racing team. Delayed briefly by a rain shower, the start of the Sunoco Red Cross 500 allowed Tony Stewart to lead the first 2 laps around the 2.5 mile before the Hendrick Motorsport customer team would be overhauled by the full-fledged Hendrick Motorsport cars. Taking the lead first for the team is the #24 Chevy of Jeff Gordon held the position until a competition caution was thrown on lap 17. When the green flag returned, the #48 Lowes Chevy of Jimmie Johnson had taken the 1st place spot through a fast pit stop. Out front, the #48 car put on a show of dominance. Aided by a long green flag which ran more than 255 miles, Johnson led 96 laps maintaining a more than 3 second interval on his teammate Jeff Gordon running in 2nd place. Through the long green run at Pocono Raceway divided the racers from each other, the high, sustained speeds eventually claimed several cars including the #47 of Marcos Ambrose who found his Toyota engine give up after only 46 laps. By the time a debris caution flew on lap 122, 9 NASCAR Sprint Cup series cars were reported as retired. Providing a breather to the competition (including Dale Earnhardt Jr. who was the free pass recipient following Johnson's torrent pace), the Pocono race was broken wide open as multiple pit strategies. June's Pocono race winner in the NASCAR Sprint Cup Denny Hamlin found his way back to the front in the #11 FedEx Toyota but would experience a much shorter thrill of leading this race spending just 19 laps out front. A second debris caution on lap 146 sent drivers and teams back to pit road with Juan Pablo Montoya grabbing the lead in the #42 Chevy. After a brief bout on the restart, Jeff Gordon reclaimed the lead and was feeling quite keen as rain showers once again approach the Pocono Raceway. With rain sprinkles reported on isolated corners of the race track, the yellow flag would fly when Dale Earnhardt Jr's #88 Chevy went for a spin in turn 1. Earnhardt Jr. continued but a more serious incident on lap 165 resulted when Jimmie Johnson's attempt in bump drafting the #2 Dodge of Kurt Busch ended with Busch spinning. The #33 Chevrolet of Clint Bowyer and Elliott Sadler's #19 Ford also collected damage in the only multi-car wreck. In fact, there was concern for Sadler as he left his destroyed Air Force Ford. Taking some daring moves, the field was mixed up again by several different types of pit stops. By lap 171, Sam Hornish Jr. landed in the 1st place position in the #77 Dodge staying on track. At one point, rain fell in the latter stage of the event making it appear possible the 4th season driver Hornish Jr. was going to pull off an upset victory. As rain-shortened wins are already unpopular, Sam Hornish's presence in NASCAR Sprint Cup victory lane could have non-supporters fuming. While two red flags temporarily stopped the caution lap pace for a total of 45 minutes, the race restarted with the #77 quickly passed by a Roush-Fenway Ford in the hands of Greg Biffle. While Biffle was able to flirt with the lead for a few laps throughout the 500 mile distance, his #16 Ford launched into the lead with 20 laps to go and never looked back. 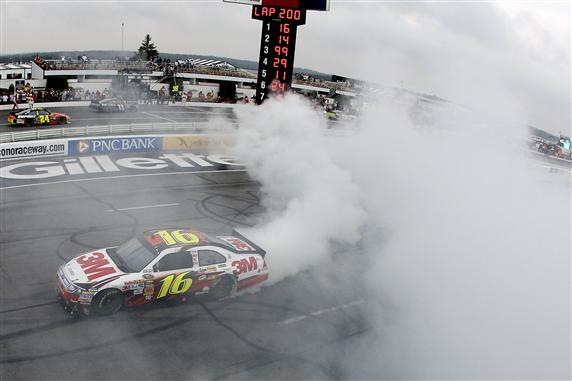 Winning by nearly 3.6 seconds over Tony Stewart, Greg Biffle and the entire #16 Roush-Fenway Racing team trekked to victory lane to celebrate the glorious result in Sunoco Red Cross 500. In 3rd place, Carl Edwards added some strength to the Roush-Fenway Racing success at Pocono. NASCAR Sprint Cup points leader Kevin Harvick's 4th place run allowed the Richard Childress Racing driver to pad a differential over 2nd place Jeff Gordon. Harvick stands 189 ahead of Gordon who minimized harm by finishing 6th in the event. In a race that took almost five hours to complete, the Ponoco Raceway has been the subject of debate for where is stands in the future of NASCAR. While many concur there will be a stop at the 2.5 mile triangular race track, considerations for shortening races down to 400 miles or perhaps even removing one of the dates are still speculated for 2011 but nothing is firm.